A new app for the iPhone purports to bring a whole wealth of humour to your phone with its joke database – but be warned, the developers are Swiss. Now far be it from us to suggest that the Swiss are not known principally for their sense of humour (cuckoo clock anyone?) 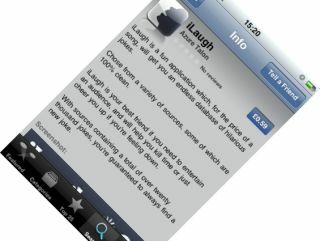 but the iLaugh app confidently claims to contain an "endless database of hilarious jokes." Indeed the makers suggest that the paid-for app will be handy for any kind of social situation you find yourself in. "It's a handy sidekick when entertaining guests, speaking to an audience, killing time or simply to cheer up a friend when they're feeling down." Apparently, iLaugh is 'quite' easy to use (we kid you not) and a 'perfect companion for comedians who're searching for that perfect punch line'. Surely they're having a laugh? It available now for 'the price of a song', or 59p if you're being specific.